This post was created in partnership with Martha Stewart Living and Boursin® Cheese. All images and opinions are my own. The holiday season has so many of us playing hostess with the mostest. Whether you have taken on the big responsibility of hosting Thanksgiving or Christmas or are just planning a small pre-holiday dinner party or gift exchange with your girlfriends, it is important to have a few go-to appetizer ideas in your arsenal. If I was left to my own devices I’d actually probably just eat appetizers on the holidays and skip the big meal- I’m sorry, turkey, but I happen to love a good cheese board way more than you! Speaking of cheese boards, this is an entertaining essential and should be every hostess’ go-to during the holiday season. 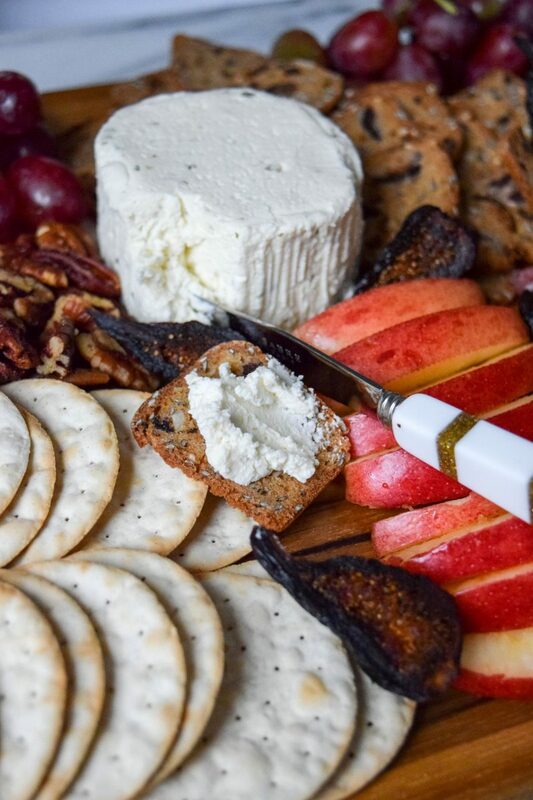 To help us all get in the holiday eating and hosting spirit, today I’m partnering with the super yummy Boursin® Cheese to share some tips for creating a great cheese board during the holiday season. Start with a stand out cheese like Boursin® Cheese. 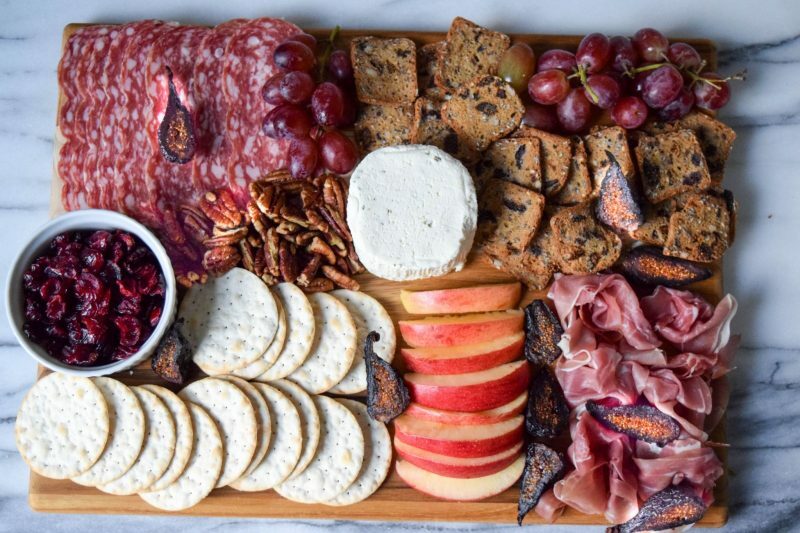 It’s called a cheese board for a reason- people love cheese!- so you want to be sure to serve a cheese (or cheeses) that keeps your guests hovered around the food. I’ve loved Boursin® for years and it definitely is a fan favorite whenever I entertain. Boursin’s® soft and crumbly texture pairs just as well with your favorite cracker as it does with crudité. It is great on it’s own but the flavors are so versatile it can be part of a crostini recipe or paired with Italian meats or seasonal fruits. Add a few complimentary cured meats for a heartier appetizer. Like I said earlier, I could easily make a meal out of my appetizer grazing during most holiday get togethers. 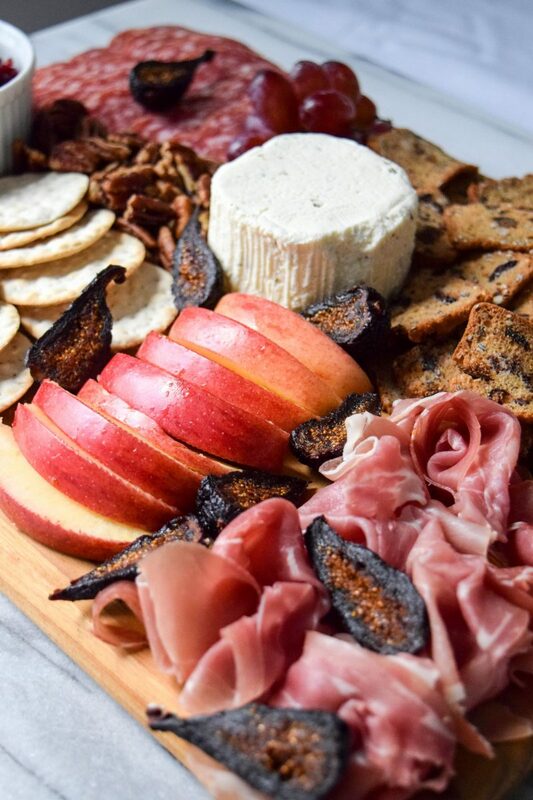 Adding a few cured meat options, such as prosciutto and salamis, to your cheese boards makes it a bit heartier for those guests that are appetizer lovers. Plus according to the hubby, most men are big cured meat fans! Serve two types of crackers- one basic and one more flavorful. I typically include two different crackers, one water cracker type that is more basic and lets the cheese be the center of attention and then a second cracker that complements the cheese but has something a little more to it. Personally I think a little variety is good, but I try to stay away from a ton of options to not overload your cheese eating guests with choices. Source your pantry for other cheese board accouterments. 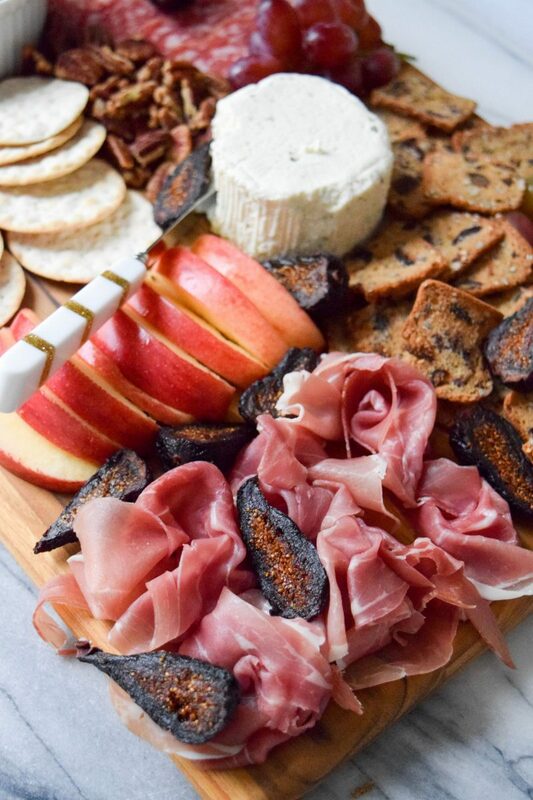 You’d be amazed at how many items you have in your own pantry that can make a big impact on a cheese board when paired with a delicious cheese like Boursin® Cheese. I almost always have dried cranberries and some sort of nuts in my pantry for salad toppings, but I love adding them to my cheese boards too. 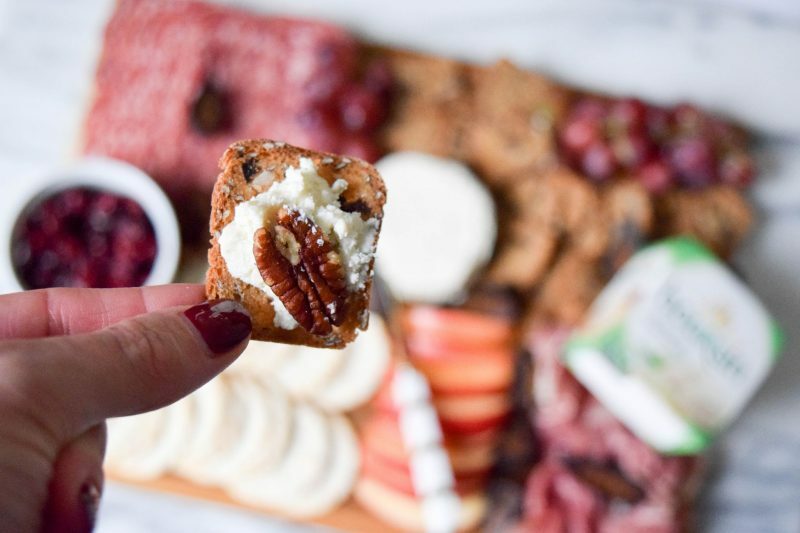 Add some Boursin® to your favorite cracker and top with dried cranberries and a candied pecan for a perfect pre-holiday snack. Other ideas: honey and jams. You likely have those in your house and both are delicious additions to a cheese board. Add some fruit for a touch of sweet and a pop of color. Grapes are a given on a cheese board, but I also love adding berries when they are in season or figs. You can also go for dried figs like I did which look good and taste great! No matter what your hosting responsibilities are this holiday season, it is a given that your guests will love a delish cheese board. It is an appetizer that is always well loved, but can be relatively easy to put together and beautiful. 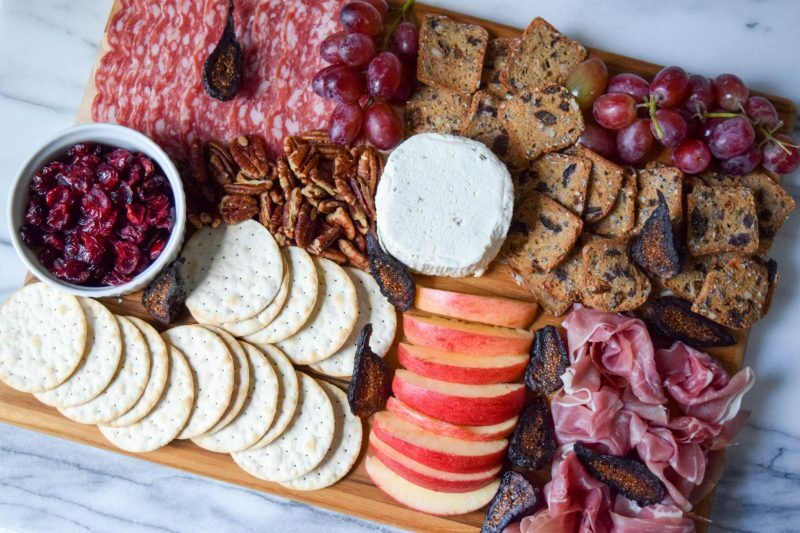 I’m definitely planning on having a few Boursin® Cheeses in the fridge this holiday season for both planned events and impromptu get-togethers! 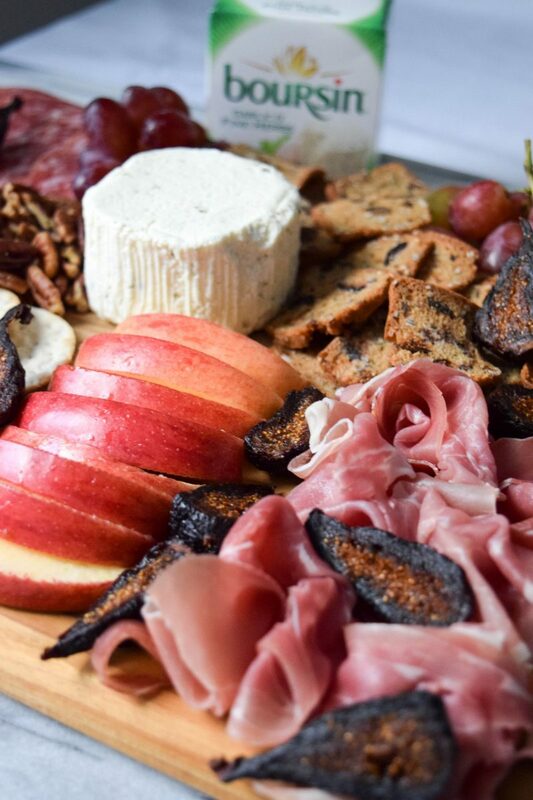 What are some of your favorite cheese board additions?